Spingjp, very nicely done. Would it be safe to say that mot if not all 12" subs would not fit largely due to the middle seatbelt anchor? 70-7552 harness and 71-7552 Harness? Why not use a posi-tap instead of using both harness? blazeplacid, did you get from this that the two connectors were used in series together, (exactly same pin out one male and other female) and not independently, in order to get the front L/R signals to the amp enabling removal to quickly go back to the HU powering the speakers? Like Lkoh's setup diagram mine should be the same although I didn't label the metra harnesses. See attached pics. I want to add an amp and sub now and later add a processor + amp to power component speakers. I was reading about the Metra 70-7552 and 71-7552 Harness and it seem that you loose illumination on your Head-unit, is that true? No but you lose steering wheel control unless you tap splice connect them. They are not in the harness side 71? harness. Last edited by m3clubracer; 06-22-2017 at 03:34 PM. that amp does not have speaker level inputs or any type of auto turn on. 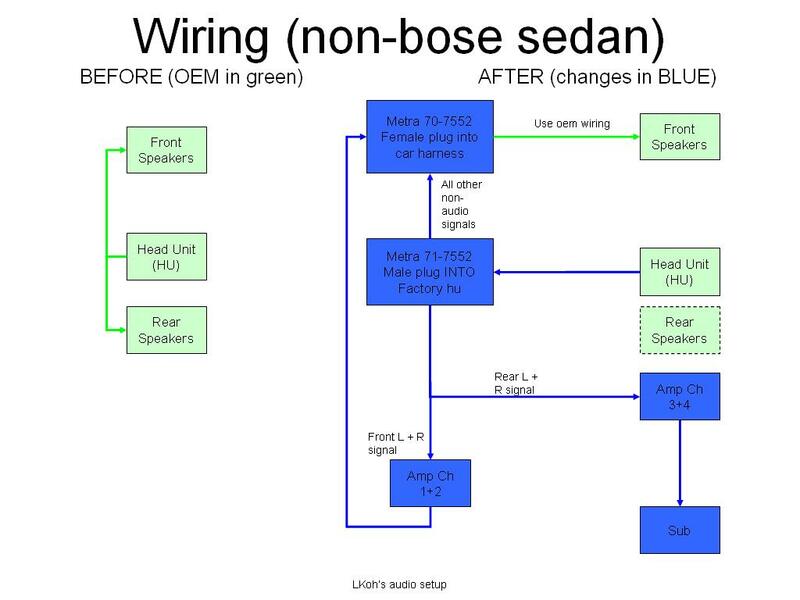 I have a 2011 G37 sedan with base audio and tapped into the wires behind the radio. it depends on which options your car has. I would use the smallest wire taps you can find. There is room but not much. Also the rear channels put out VERY little signal. Im guessing the rear speakers are very efficient. Don't mean to revive an old thread, but I'm currently planning out an install for a 2011 G25x and had a few questions. Speakers are these Kappas from Infinity. Looks like I shouldn't need spacers. I've decided against running a LOC. I purchased a RD900/5 from JL, and it seems prepared to take high-level signals. I was thinking about running signal from the head unit using the Metra, but I hate the idea of losing steering wheel controls. Also, my installer has mentioned that he prefers to get his signals from the rear speakers. 1) Is there enough of a signal in the rears or would the head unit method give me a better signal with a broader range of frequencies? 2) Would I retain full use of my steering wheel controls if I tapped signal from the rears? 3) I'm not interested in changing out the rear door speakers. Is it possible to amplify my new components using the JL, but run the stock rear speakers from the head unit? Sorry if these are rookie questions. Last edited by chuck4321; 06-22-2017 at 01:56 PM. If you plan on running that JL amp you will need a LOC. That amp will not accept speaker level inputs. 1 - I would only tap into the fronts unless you can get an LOC with gain adjustment. Trial and error would be the best bet on the rear speakers. Your installer is trying to save time by only tapping into the rear speakers which I understand. I would still only recommend tapping into the front especially if you are going to run a 5 channel amp. 2 - The only way you would lose steering wheel control is by removing the factory head unit. Tapping into speaker wires will cause no issues. 3- You can power the rears via the headunit and power the other speakers via an amp. I noticed the metra interconnect isn't a 1 to 1 interconnect between them, a bit hesitant to use it on my '11 g37 convertible. I'm thinking more going to tap the input, or the outputs off the bose amp in the rear, about the same at a high level input, but otherwise hoping the amp can clean them up enough. Anyone else struggle with sound on a 'vert? 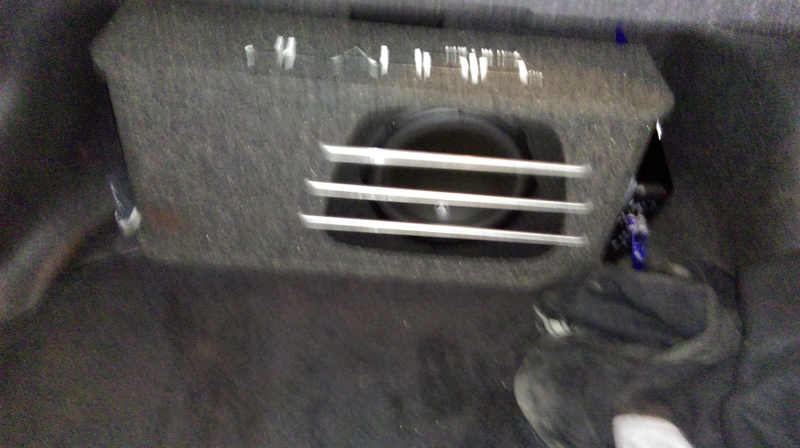 Do I need rear speakers?